Rice played a greater role than she admitted last fall in written testimony to the Senate Armed Services Committee. WASHINGTON — Then-national security adviser Condoleezza Rice verbally OK'd the CIA's request to subject alleged al-Qaida terrorist Abu Zubaydah to waterboarding in July 2002, a decision memorialized a few days later in a secret memo that the Obama administration declassified last week. Rice's role was detailed in a narrative released Wednesday by the Senate Intelligence Committee. It provides the most detailed timeline yet for how the CIA's harsh interrogation program was conceived and approved at the highest levels in the Bush White House. The new timeline shows that Rice played a greater role than she admitted last fall in written testimony to the Senate Armed Services Committee. The narrative also shows that dissenting legal views about the severe interrogation methods were brushed aside repeatedly. But even the new timeline has yet to resolve the central question of who inside the Bush administration first broached the idea of using waterboarding and other brutal tactics against terror detainees in the months after the Sept. 11, 2001, attacks on the United States. The Intelligence Committee's timeline comes a day after the Senate Armed Services Committee released an exhaustive report detailing direct links between the CIA's harsh interrogation program and abuses of prisoners at the U.S. prison at Guantanamo Bay, Cuba, in Afghanistan and at Iraq's Abu Ghraib prison. Both revelations follow President Barack Obama's release of internal Bush administration legal memos that justified the use of severe methods by the CIA, a move that kicked up a firestorm from opposing sides of the ideological spectrum. According to the new narrative, which compiles legal advice provided by the Bush administration to the CIA, Rice personally conveyed the administration's approval for waterboarding of Zubaydah, a so-called high-value detainee, to then-CIA Director George Tenet in July 2002. 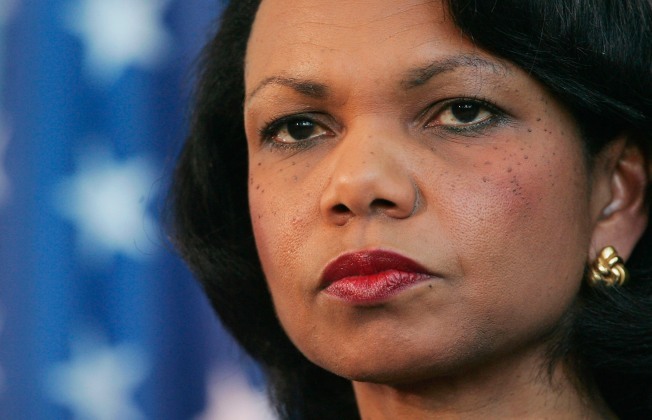 Last fall, Rice acknowledged to the Senate Armed Services Committee only that she had attended meetings where the CIA interrogation request was discussed. She said she did not recall details. Rice omitted her direct role in approving the program in her written statement to the committee. A spokesman for Rice declined comment when reached Wednesday. Days after Rice gave Tenet the nod, the Justice Department approved the use of waterboarding in a top secret Aug. 1 memo. Zubaydah underwent waterboarding at least 83 times in August 2002. In the years that followed, according to the narrative issued Wednesday, there were numerous internal legal reviews of the program, suggesting government attorneys raised concerns that the harsh methods, particularly waterboarding, might violate federal laws against torture and the U.S. Constitution. But Bush administration lawyers continued to validate the program. The CIA voluntarily dropped the use of waterboarding, which has a long history as a torture tactic, from its arsenal of techniques after 2005. According to the two Senate reports, CIA lawyers first presented the plan to waterboard Zubaydah to White House lawyers in April 2002, a few weeks after his capture in Pakistan. In May 2002, Rice, along with then-Attorney General John Ashcroft and White House counsel Alberto Gonzales met at the White House with the CIA to discuss the use of waterboarding. The Armed Services Committee report says that six months earlier, in December 2001, the Pentagon's legal office already had made inquiries about the use of mock interrogation and detention tactics to a U.S. military training unit that schools armed forces personnel in how to endure harsh treatment. In July 2002, responding to a follow-up from the Pentagon general counsel's office, officials at the training unit, the Joint Personnel Recovery Agency, detailed their methods for the Pentagon. The list included waterboarding. But the training unit warned that harsh physical techniques could backfire by making prisoners more resistant. They also cautioned about the reliability of information gleaned from the severe methods and warned that the public and political backlash could be "intolerable." "A subject in extreme pain may provide an answer, any answer or many answers in order to get the pain to stop," the training officials said in their memo. Less than a week later, the Justice Department issued two legal opinions that sanctioned the CIA's harsh interrogation program. The memos appeared to draw deeply on the survival school data provided to the Pentagon to show that the CIA's methods would not cross the line into torture. The opinion concluded that the harsh interrogation methods would be acceptable for use on terror detainees because the same techniques did not cause severe physical or mental pain to U.S. military students who were tested in the government's carefully controlled training program. Several people from the survival program objected to the use of their mock interrogations in battlefield settings. In an October 2002 e-mail, a senior Army psychologist told personnel at Guantanamo Bay that the methods were inherently dangerous and students were sometimes injured, even in a controlled setting. "The risk with real detainees is increased exponentially," he said. Nevertheless, for the next two years, the CIA and military officials received interrogation training and direct interrogation support from JPRA trainers. Last week, the Obama administration's top intelligence official, Dennis Blair, privately told intelligence employees that "high value information" was obtained through the harsh interrogation techniques. However, on Tuesday, in a written statement, Blair said, "The information gained from these techniques was valuable in some instances, but there is no way of knowing whether the same information could have been obtained through other means."